Clover Wireless provides private label trade-in solutions for wireless carriers, retailers, OEMs and corporate customers. 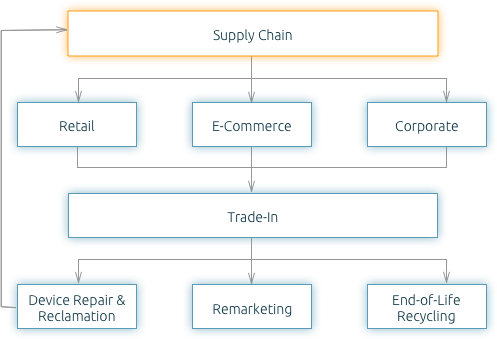 All of Clover Wireless’ trade-in solutions can be implemented à la carte or managed through our vertically integrated, closed loop approach to optimize and streamline the mobile device supply chain. Powering all of our trade-in solutions is our industry-leading custom trade-in platform. This cloud-based platform is flexible, stable and scalable and provides multi-channel, currency and language support. Third party integration via standard APIs, timely product releases and easy onboarding enables the Clover Wireless platform to support a wide-range of customer needs regardless of IT infrastructure. Clover Wireless develops and manages innovative customized trade-in and buyback solutions, including repair and reclamation services, that deliver devices back into the supply chain faster than the competition. Based on program metrics, Clover Wireless is able to forecast device returns and integrate into customers’ demand planning resulting in more efficient and streamlined inventory management and logistics. Clover Wireless’ repair and reclamation services are unsurpassed. With the largest mobile device repair center in North America and a team of over 12,000 dedicated Repair Technicians, Engineers and support personnel, Clover Wireless use its precision repair services and heavy reclamation capabilities to restore devices to "like new" condition– minimizing waste and maximizing value for customers. Clover Wireless uses the latest automated data sanitization tools to ensure the removal of all personal data from each device. You will be provided a detailed report by serial number verifying the successful removal of all data. 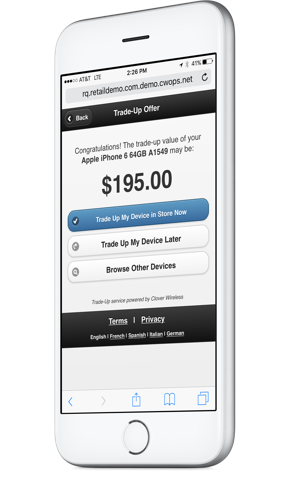 Clover Wireless will create a customized logistics plan to support your trade-in or buyback program. Simplifying logistics, tracking and reporting is at the root of our programs. Clover Wireless’ environmental stewardship programs are certified from the leading organizations and our environmental practices are validated by third parties.